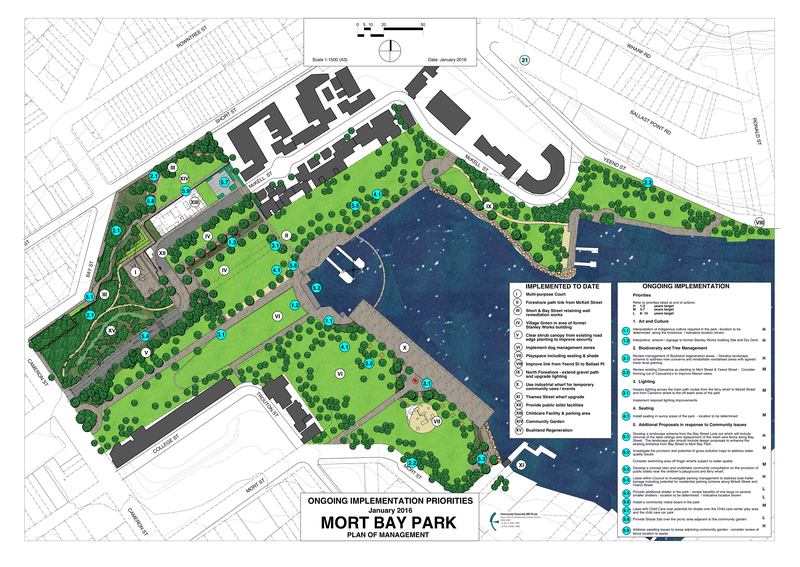 Environmental Partnership was commissioned to prepare a plan of management, masterplan and construction documentation for the Mort Bay Park site at Balmain. The plan of management was to address the extension of an existing foreshore open space to meet community needs whilst addressing the inherent design, facilities, and landscape amenity issues of the existing environment. Several options were considered that canvassed varied degrees of change to existing road access that enabled consolidation of usable recreation area and enhanced public safety. The optimisation of the heritage fabric of the site for foreshore industry was also developed through the design exercise and in interpretation recommendations. Management strategies put in place a framework for effective environmental and usage management of the site which has a wide range of use from local neighbourhood and family recreation to annual events (such as new years eve fireworks), and large vessel mooring. Recommended site planning provided strategies to address site issues including contamination and wall stability whilst integrating the communities aim of a more natural environmental setting.